Condensation will occur on any interior surface that falls below the Dew Point Temperature (Tdp) of interior ambient air. Tdp is dependent on temperature and Relative Humidity, as warm air can hold more moisture than cold air. Condensation can be unsightly, unsanitary, and over long periods of time, can damage adjacent building materials. For these reasons, condensation assessment of both frame and glass is recommended for those applications where high humidity is maintained, such as residences, data centers, intensive care units, therapy pools or kitchens. A "guarded hot box" constructed per ASTM C236, is essentially a large highly-insulated room divided into a "cold side," and a "warm side." An insulated wall separates the cold side from the warm side, and it is into this wall that the test specimen is mounted. Photo courtesy Architectural Testing, Inc.
On the cold side, a large fan simulates a 15 mph wind directed at the exterior face of the test specimen. Cold side temperature is held constant at about 0?F, per ASHRAE standards. On the highly insulated (or "guarded") warm side, temperature is held constant at 70?F by a small electric heater. By measuring the energy necessary to heat the warm side, an indirect measurement of heat loss through the specimen in BTUs per hour is inferred. At the same time that heat loss is being measured, 24 thermocouple sensors measure surface temperatures on the inside of the sample, for use in condensation resistance calculations. Guarded hot box testing yields two performance metrics; U-Factor and Condensation Resistance Factor (CRF). U-Factor is a measure of air-to-air heat flow per unit time, area and temperature drop, and is basically the reciprocal of the familiar "R-Value" cited for insulation products. With U-Factor, "...the smaller, the better." The building's Mechanical Engineer uses this data to estimate annual energy consumption for both heating and cooling, and to determine peak loading, for sizing boilers and chillers. Whereas U-Factor is "averaged" across all areas of the test specimen, CRF addresses the local nature of condensation. The minimum of glass surface temperature (GT) or cold-point-weighted frame temperature (FT) is used to calculate a unit-less ratio, somewhat analogous to a percentage. With CRF, "...the bigger, the better." CRF can be reported as a "frame CRF" or "glass CRF," but remember that the minimum number will control. CRF methodology is useful in comparing design options or competitive products, or for assessing compliance to a performance specification. It yields a valid and repeatable result, based on standard pre-defined test configurations, without trim or installation accessories. However, to predict condensation, it is technically preferable to start from basic principles of thermodynamics; using minimum tested or modeled local U-Factor at the cold point of the frame or glass, and winter outside design temperature, to calculate whether any surface will fall below Tdp. The CRF Tool on AAMA's website (www.aamanet.org) makes this process easier by providing a handy calculator, yielding a recommended CRF, for a user-input project site and interior Relative Humidity level. The CRF Tool assumes that some condensation is acceptable under extreme conditions. Installation details in which interior frame surfaces are covered by adjacent materials can drop surface temperatures on aluminum framing, as can thermal short-circuits in detailing. In the early '80s, finite element computer modeling was developed to predict thermal performance of untested frame-glass combinations or custom systems. Many manufacturers and test labs have modeling capabilities in-house. Finite element thermal modeling accurately predicts U-Factors, as well as surface temperatures of glass and non-conductive framing materials such as PVC and wood. Modeling is not as accurate in predicting surface temperatures of some aluminum framing configurations, and caution is advised in applying results to field condensation prediction. Condensation resistance analysis is a critical part of properly designing fenestration products for commercial buildings. Wausau's technical team is always ready to help with this important analysis on your building. 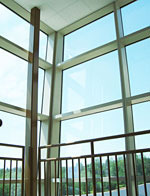 Find us online at www.wausauwindow.com.